Nominations Now Open for the Global Pluralism Award! The Global Centre for Pluralism is thrilled to launch the new Global Pluralism Award. The Award recognizes individuals and organisations working to promote more diverse, inclusive societies around the world. Nominations are now open and will be accepted until August 31st, 2016. Submit an application or nominate a worthy initiative at award.pluralism.ca. Three awardees will be selected by an independent, international jury. Each recipient will receive a prize of $50,000 CAD to further their work in support of pluralism. Additional in-kind assistance may be provided, including engagements in each recipient’s country of operation to raise the public profile of their achievements. The Award will be presented in 2017 at the international headquarters of the Global Centre for Pluralism in Ottawa, Canada. Individuals, businesses, academics, civil society and governments are eligible for the Global Pluralism Award. By engaging a broad range of recipients, the Award affirms that the promotion of pluralism is not the sole responsibility of governments or non-profits, but of society as a whole. Please visit the Award website, award.pluralism.ca for more information, and to submit your nomination. Thank you so much for joining us at the 2016 Annual Pluralism Lecture, delivered by Justice Albie Sachs, and the subsequent Q & A with Globe and Mail columnist Doug Saunders. We hope you enjoyed the event. 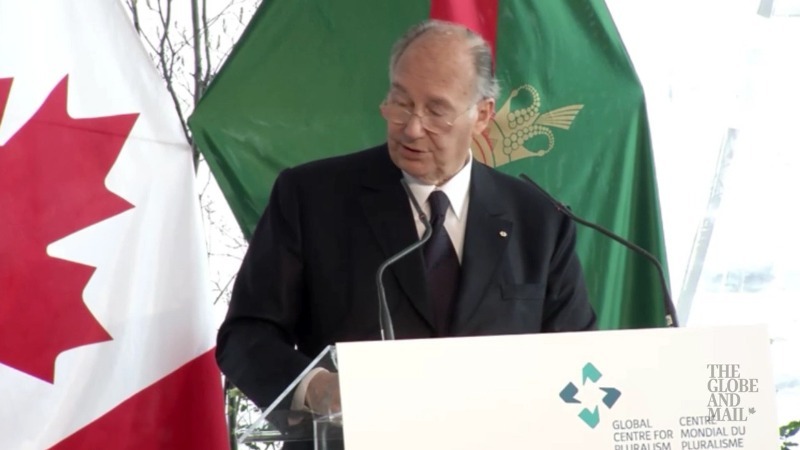 We have updated our website with the full video of the event and the full text of His Highness the Aga Khan’s introductory remarks. The transcript of Justice Sachs’ remarks will be available on that page in the coming weeks. French video subtitles will also be available shortly. A photo album on our Facebook page features pictures from the reception and Lecture. Please feel free to “like” our Facebook page for future Centre events and announcements. We also wanted to direct you to some of the media coverage of the event. Here is a link to Justice Sachs’ thoughtful op-ed in the Globe and Mail, his interview on CBC’s Metro Morning with host Matt Galloway, and a video interview with Tony Keller of the Globe and Mail. The Centre’s one-on-one video interview with Sachs will be released in the coming weeks, as well as a CBC Ideas interview that will air on June 28th. If you like our page on Facebook, you will find these and other updates. You may also sign up for our mailing list to be kept informed. Thank you again for your support of the Global Centre for Pluralism, and for helping to make our fifth Annual Pluralism Lecture a success. PS: Please take the time to fill in this very brief survey about your experience at the 2016 Annual Pluralism Lecture! South African Jurist Albie Sachs delivered the Lecture entitled, “The Battle for South Africa’s Constitution” at the fifth Annual Pluralism Lecture in Toronto. What’s new at the Global Centre for Pluralism? / Quoi de neuf au Centre mondial du pluralisme? Are you involved in a project that is contributing to greater appreciation and respect for diversity? You can apply for one of three $50,000 Global Pluralism Awards. Do you know of a worthy project that deserves this award? Nominate them! The due date for applications and nominations is August 31, 2016. Please visit award.pluralism.ca for more information, FAQs, and to start the process! The Annual Report highlights the programs and resources that are being developed at the Centre, including the launch of an ambitious global research program and new partnerships. You can read the report here. We are happy to announce that an exclusive interview with Justice Albie Sachs is now online. Sachs discusses the elements of South Africa’s constitution-making process that may be instructive for other divided societies; he also provides his own definition of pluralism. Watch the interview here. You can also watch his Pluralism Lecture delivered in Toronto in May, now broken into shorter segments. All videos are available with French subtitles. Watch the Lecture here. The Global Centre for Pluralism is an independent, charitable organization founded by His Highness the Aga Khan in partnership with the Government of Canada. Inspired by Canada’s experience as a diverse and inclusive country, the Centre was created to advance global understanding of pluralism and positive responses to the challenge of living peacefully and productively together in diverse societies. A jury of international leaders, chaired by the Rt. Hon. Joe Clark, former Canadian Prime Minister, has been named to select the winners of the first inaugural Global Pluralism Award. The Award recognizes individuals and organisations whose high-impact, innovative initiatives are tackling the challenge of living peacefully and productively with diversity. The Award is a program of the Global Centre for Pluralism, an international research and education centre founded by His Highness the Aga Khan in partnership with the Government of Canada. The members of the jury represent a range of sectors, including local government, the business world and civil society. Through their own work on inclusive citizenship, social welfare and community development, the jury members all appreciate first-hand the extraordinary effort it takes to build societies where differences are valued and respected. Their expertise will inform the selection process for the top three awardees, who will be named at a ceremony in Ottawa, Canada in November 2017 at the Global Centre for Pluralism’s new international headquarters. Bio notes for jury members can be found at this link. Each recipient will receive a prize of $50,000 CAD to further their work in support of pluralism. The Award is accepting nominations until August 31st, 2016 at award.pluralism.ca. Click here to learn more about the Award! Pluralism and Peace in a Fragmenting World: What is Canada’s Role? In an increasingly fragmented conflict landscape, characterised by growing sectarianism, nationalism and polarisation, how can Canada contribute to reinventing the tools of peacebuilding to support more pluralistic, peaceful societies? One of the most challenging elements of post-conflict recovery is establishing a genuine commitment to valuing diversity. The failure to embed pluralism in mediation efforts and peace agreements can lead to renewed conflict and instability. Join experts at our next public Forum to discuss pluralism in peacebuilding and the opportunities for Canadian leadership. Mr. President, Excellences, distinguished guests, ladies and gentlemen, it is a privilege to speak to you today on one of the most important issues of our time: the relationship between religion, pluralism, and democracy. Let me say at the outset that I believe that religion, pluralism and democracy are not incompatible. To the contrary, I believe that that they should be mutually reinforcing foundations of healthy, stable, and prosperous societies. From the dawn of time, and at the four corners of the earth, religion and faith have provided humanity with ethical codes and spiritual guidance and comfort. At its best, religion has been a driving force for personal and social progress. Even in secular states, religious norms have inspired many of their laws and customs. But we cannot deny that religions have also often been instrumentalised to exclude, to persecute and even to kill “the other”, whether an external enemy or a close neighbour. In our increasingly diverse societies, the only way to avoid conflict and ensure that all believers, whatever their faith, are able to practice freely is by ensuring that religion is tempered by the principle of pluralism. The Global Centre for Pluralism- which was established by His Highness the Aga Khan and the government of Canada, and of which I am a board member- defines pluralism as a concept which not only respects diversity, but actually values and celebrates it because of its recognized benefits to society. In her acclaimed study on the decline and fall of history’s dominant empires, the Yale University professor, Amy Chua, reveals that the most successful empires in world history, from Ancient Persia and Rome to the Tang Empire in China, were based on pragmatic pluralism. Pluralism allowed them to successfully integrate a wide variety of peoples into their systems, and then draw on their manifold talents and knowledge to defend and expand their empires because they all had a stake in them. Their downfall, she argues, stemmed from their embrace of intolerant and exclusionary attitudes. Democracy is the system best suited to securing and sustaining pluralism in today’s world. True democracy enshrines the rights and liberties of all individuals in law and institutions, regardless of race, gender, or religion, and gives everyone a voice. I could not think of a better country in which to deliver this message than Indonesia, whose national motto is “Bhinneka Tunggal Ika” or Unity in Diversity. This great country made up of roughly 300 ethnic groups and more than 700 languages, and many faiths, spread out across a vast archipelago is a heartening confirmation that pluralism can work. Speaking here in Bali, whose unique heritage and traditions make it one of the world’s most prized destinations, only highlights the benefits that diversity can bring to a country. Yet in too many parts of the world today, that mutually reinforcing and beneficial diversity is under threat. Globalization, while integrating the world’s economies, societies and people more than ever, and creating unprecedented wealth across the globe, is also generating a backlash because the benefits are not fairly shared and the gap between the rich and the poor has widened. The losers of globalization- encouraged by populist politicians – are retreating into primal identities, some real, some imagined, as bulwarks against uncertainty and fear. Around the world, groups or movements are trying to reject the ties that bind all of us across religious, national, racial, and class divides. Populist and xenophobic movements are demonizing migrants and other minorities in the name of protecting their own identities, often based on some notion of ethnic and or religious purity. Even more brutally, religious extremists are denying humanity not only to those of different faiths, but even to those of their own faith who do not share their convictions. Diversity is increasingly being portrayed as a threat that undermines our societies, rather than an asset that can benefit us all. Unfortunately, the democratic institutions that are best placed to counter these forces are also being challenged. Confidence in these institutions is declining, and not just in new democracies. Party membership, voter participation and trust in politicians are declining in old and well-established democracies too. There is a feeling that democracy is being hollowed out and that its institutions and processes are not functioning properly, or in the interest of the people from whom power is derived. In many countries, we see democratically-elected leaders becoming increasingly authoritarian and stretching their stay in power indefinitely. If citizens do not believe they can change their leaders through the ballot box- the accepted mechanism for peaceful and democratic rotation of leadership- they will find other ways, even at the risk of destabilising their countries. These trends are undermining our faith in each other and in our institutions. That is why my Foundation is emphasising the legitimacy of democracy through elections with integrity. Elections with integrity are not only free and fair but ensure legitimacy for the winner and security for the loser. As I have often said, the problem is not the faith but the faithful. Religion can be harnessed for the good, but also misused. We must stress the basic values that are common to all religions: compassion; solidarity and respect for the human person. At the same time, we need to get away from stereotypes, generalizations and preconceptions, and take care not to let crimes committed by individuals, or small groups, dictate our image of an entire people, an entire region, or an entire religion. We must also avoid the trap set by extremists of limiting human beings to one identity. We all have multiple identities which enrich us as individuals. While we may differ, we can share a common love of our families, or our national heritage and our faith. We must accept that what we have in common far exceeds that which divides us, and we don’t have to hate the “other” to love who we are. And we must fight to revitalise democracy itself, because sustaining diversity in a peaceful and productive manner is only possible in a democratic system of government. To paraphrase Winston Churchill, democracy is the worst form of government ever invented, except for all the others. But we cannot take democracy for granted. Recent elections in a number of countries have shown us democracy is a fragile flower.However, those elections have obliged mainstream leaders to recognize that the material benefits of globalization have not been evenly shared and many have been left behind or fallen through the safety net. They show too why voting matters. Many of the populists’ most rabid critics do not vote, and then express surprise and dismay when they win. But democracy is not just about elections, rather, democracy is first and foremost about laws and institutions that guarantee the rights of its citizens, and respects, even protects, religious freedom. Plural societies, however, often prove hard to govern because of their diversity. As Indonesia knows, successful governance in such societies requires inclusive leadership, to build and sustain trust across communities over time. We must also recognize there is no one-size-fits-all approach to this task. The way ahead is difficult but the future demands that we rise to the challenge. This will require leadership from all regions of the globe, and all parts of society. Politics is too important to be left to politicians alone: religious leaders; business leaders; civil society organizations; and ordinary citizens must demonstrate their commitment to the morals of their faith and the values of democratic pluralism. Ladies and Gentlemen, no one is born a good democrat and no one is born a good citizen. It was an Indonesian, Alwi Shihab, who noted that democracy is a habit we need to cultivate. Mutual respect and tolerance have to be fostered and passed on to each successive generation. We have to learn from each other, making our different traditions and cultures a source of harmony and strength, not discord and weakness. Only by learning from each other can we build a global community based on those core truths that every religion teaches us: respect and love for all humanity, because we are all the children of God. Prime Minister Stephen Harper, left, congratulates the Aga Khan after his address to Parliament in 2014. The spiritual leader's Global Centre for Pluralism, created with the backing of Harper's government, is finally moving in to its Ottawa home. A think-tank founded by the Aga Khan with $30 million from taxpayers has finally moved into a prime heritage building in Ottawa 10 years after the federal government gave it a 99-year lease. The Global Centre for Pluralism (GCP) pays the federal government $1 a year to use the building at 330 Sussex Dr., formerly the Canadian War Museum. The agreement also allows the GCP to lease out office space in the building at commercial rates. And it already has a tenant: the Royal Canadian Mint, a Crown corporation. The centre's opening comes after a decade of false starts and missed deadlines. 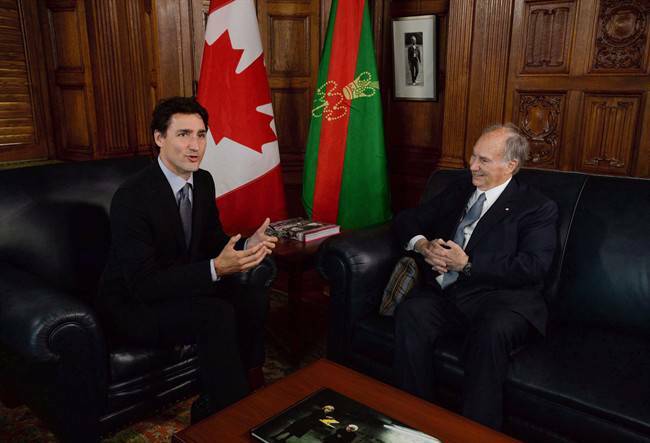 It also highlights the close relationship successive Canadian governments have sought to foster with the Aga Khan, the hereditary leader of the world's Ismaili Muslims and a well-known philanthropist. Prime Minister Justin Trudeau has been forced to defend his recent visit to the Ismaili spiritual leader's private island in the Bahamas. Trudeau, who through his father has a long personal relationship with the Aga Khan, has said the visit and a similar one in 2014 were personal. But the Aga Khan and his charitable organizations have a long-standing relationship with the government of Canada, which sees their development work as aligned with Canada's objectives and has contributed money to their projects for decades. The Global Centre for Pluralism got its start in 2006, when the government of Stephen Harper gave $30 million to establish an operating fund for the think-tank, which is supposed to spread Canadian values of pluralistic democracy around the world. In return, the Aga Khan committed $10 million of his own money and pledged to pay for the necessary renovations to the heritage building, which sits between the Royal Canadian Mint and the National Gallery. Although the National Capital Commission finalized the lease transfer in 2007, the centre didn't set up a board of directors until 2010. For several years, it has operated out of temporary offices in the Ismaili Imamat, the Aga Khan's diplomatic mission in Ottawa. The centre had an agreement with Canada to be up and running at the new site by December 2014, but as that deadline approached, it asked for an extension. Government records obtained by CBC show it got a new deadline of September 2016, but when that date arrived the building still wasn't ready. The GCP hosts an annual lecture and awards ceremony, as well as an annual roundtable discussion. It has also produced some reports and papers, with a focus on Kenya and Kyrgyzstan. Its next scheduled project is a report on "the economic dimensions of pluralism in Canada," based on research by the Pierre Elliott Trudeau Foundation. GCP director John McNee says neither Conservative nor Liberal governments have ever questioned whether the centre is producing value for Canada's investment. "These things take time," he says. "In the initial phase it's been important to build up an analytical framework to understand these ideas" of how pluralism can benefit societies. "The business plan is that over the long term the centre will expand to occupy the whole building. This is the end of the initial phase, and over the next 10 years we'll learn what our needs are. And then we'll see." The GCP's corporate report shows its original endowment has grown to $54 million. The construction delays were partly due to the fact the building was in worse condition than expected. The work included asbestos removal, McNee says. "It's like buying an old house. Once you move in, you find things that need fixing." He says the work cost the Aga Khan approximately $35 million. "The building was made available at a time when no government department or agency had expressed an interest in occupying it. Here you have a global philanthropist putting a very large amount of money into restoring a piece of Canadian heritage and infrastructure." In 2013, the Aga Khan Foundation asked the government to allow it to rent out office space in the building. It wanted to be able to sub-lease 2,800 square metres, or more than half of the total floor space. In briefing notes obtained by CBC News through access to information, public servants with the National Capital Commission raised concerns the property "would be in direct competition with the NCC's rental space in the Byward Market, and given that the GCP's lease is at a nominal rate, the NCC could potentially suffer financially." Despite the warning, the NCC granted the right to sub-lease, which required a municipal zoning amendment that cost the foundation $10. The NCC did turn down a GCP request to grant 20-year subleases, limiting them to 10 years and insisting it be consulted about potential tenants. The requests for deadline extensions and leasing authority came as the Harper government was looking to draw closer to the Ismaili leader. A 2013 "memorandum for action" prepared for Foreign Affairs Minister John Baird suggests "options aimed at moving toward a strategic partnership with the Aga Khan." The memo notes the Aga Khan had already been made a member of the Order of Canada and an honorary citizen and received privileges normally reserved for foreign heads of state and heads of government, including the right to enter and leave the country through Ottawa's Hangar 11. The memo suggests "extending additional courtesies," but they are blacked out in the document released to CBC. In January 2014, International Development Minister Christian Paradis announced an additional $150 million for the Aga Khan Foundation, and Prime Minister Stephen Harper wrote to the Aga Khan at his estate in Aiglemont, France, inviting him to make an official visit to Canada, where he would be given the rare privilege of addressing Parliament. Prime Minister Stephen Harper welcomes the Aga Khan, spiritual leader of the Ismaili Muslims, to Parliament Hill in Ottawa on Thursday, February 27, 2014. The government earmarked the extra money for the Aga Khan without a clear idea of how it would be spent, and officials were aware their minister could face questions about it. Under the heading "Defensive Lines," they provided Paradis a response to any tough questions on the matter: "We are still in the process of determining precise allocations for the additional $150 million." Video of the Aga Khan's appearance in Parliament, as well as an invitation-only speech he gave at Massey Hall in Toronto, was posted on stephenharper.ca. In order to view it, visitors had to give an email address and were soon hit with emails from the Conservative Party, in which Immigration Minister Chris Alexander described the Aga Khan and Harper as "two great world leaders." The episode provides an insight into why both Conservatives and Liberals have shown a desire to be close to the Aga Khan, whose estimated 80,000 Canadian Ismaili followers make up one of the country's most generous — and most coveted — donor communities. That point wasn't lost on anyone involved in the GCP negotiations. A briefing note drafted for Baird as he prepared to sign off on the think-tank's 2014 annual report, and obtained through access to information, reminds the minister that Ismailis "live in every part of the country, with large and influential communities located in urban centres of Ontario, Alberta and British Columbia. "If they can, Ismailis donate about one-eighth of their income as a tenet of their belief." PLEASE NOTE: This lecture takes place at 199 Sussex Drive, the Delegation of the Ismaili Imamat. NOT at 330 Sussex Drive. Order of Canada architect Shirley Blumberg will speak about the repurposing of 330 Sussex Drive, formerly the Canadian War Museum, which is soon to open as the Aga Khan’s Global Centre for Pluralism. This presentation will explore the aspirations, highlights and challenges of the renewal of this significant Capital landmark. This special lecture event takes place at the Delegation of the Ismaili Imamat. Please note that pre-registration will be required for this event. Details and a registration link will be posted by mid-January. Shirley Blumberg, Architect is a partner at KPMB Architects in Toronto, and is a Member of the Order of Canada “for her contributions to architecture and for her commitment to creating spaces that foster a sense of community.” Her portfolio ranges from mixed-use developments to highly specialized cultural and academic institutions, many with a focus on revitalizing heritage contexts. The vision of the Global Centre for Pluralism is a world where human differences are valued and diverse societies thrive. Its mission is to serve as a global platform for comparative analysis, education and dialogue about the choices and actions that advance and sustain pluralism. Founded in Ottawa by His Highness the Aga Khan in partnership with the Government of Canada, the Global Centre for Pluralism is an independent, charitable organization. Inspired by Canada’s experience as a diverse and inclusive country, the Centre was created to advance positive responses to the challenge of living peacefully and productively together in diverse societies. 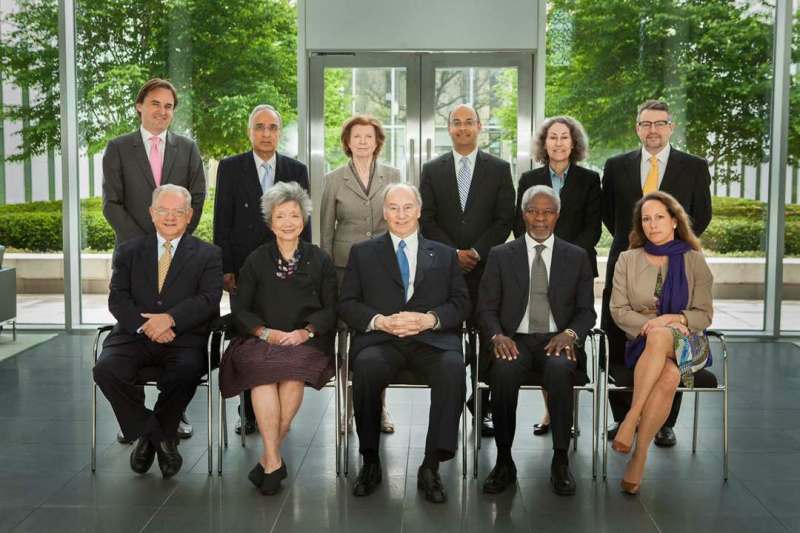 The Centre is governed by an international Board of Directors and chaired by His Highness the Aga Khan. The Centre defines pluralism as a set of values and actions, founded on respect for diversity, which support and sustain inclusive societies. In pluralist societies, choices are made to ensure the full participation of all people in political, economic and socio-cultural life. Every person becomes a valued member of society – regardless of ethnic, religious or cultural difference. Global Centre for Pluralism and the Pierre Elliott Trudeau Foundation invite you to join us for the official launch of the Pluralism Project’s research findings and a discussion about the policy implications at the Centre’s new headquarters. Seating is very limited. Registration is on a first-come, first-served basis. On March 30th, the Global Centre for Pluralism launched Accounting for Change in Diverse Societies—a new publication series comprised of country “change cases” and thematic overviews that explores global pathways to pluralism. To mark the occasion, the Centre convened a Pluralism Forum to explore the responses of Malaysia, Brazil and Nigeria to group inequalities. Inequalities between groups are a fundamental barrier to pluralism in countries around the world. Led by overview author Frances Stewart (University of Oxford), the panel featured three change case authors. Hwok-Aun Lee (Institute for Southeast Asian Studies) reviewed the pros and cons of constitutional guarantees as levers of affirmative action for indigenous majorities. Daniela Ikawa (Columbia University) highlighted the importance of social movements and the recognition of group-based identities as catalysts for redress of systemic racial discrimination. Daniel Agbiboa (University of Pennsylvania) considered how territorially-bounded identities can both enhance and impede pluralism. Commenting at the end, overview author Will Kymlicka (Queen’s University) highlighted the important work of both institutions and public mindsets—hardware and software—in all efforts to foster greater pluralism. On April 24th, the Global Centre for Pluralism hosted the launch of the report, “The Diversity Dividend: Canada’s Global Advantage,” in partnership with the Pierre Elliott Trudeau Foundation and the Centre for International Governance Innovation. The report presented the findings and policy recommendations arising from a year-long research project examining the links between diversity and economic prosperity. The research project, led by Dr. Bessma Momani and Jill Stirk, and supported by the Pierre Elliott Trudeau Foundation, showed positive correlations between workplace diversity and both revenue and productivity in companies in 13 industrial sectors in Canada. Across all the industries studied, a 1% increase in ethnocultural diversity was associated with an average 2.4% increase in revenue. The launch event featured a panel discussion between distinguished representatives from the private sector, civil society, academia and the media. The discussion focussed on how their sectors are being impacted by, and responding to, issues of diversity in Canada. The event was attended by over 100 guests at the Centre, with exceptional online engagement and livecast viewing. The conversation online with the hashtag #diversitydividend trended in Canada. The findings of this research project will have important implications for public policy and the public discourse around issues of diversity, immigration and the growth of the Canadian economy. The Centre was honoured to help share this report with Canadians across the country. The Global Centre for Pluralism will officially open on May 16, 2017 in Ottawa. Diversity is a benefit and not a risk. A video highlighting the official opening of the international headquarters of the Global Centre for Pluralism will be shown on Friday, May 19 after Jamati ceremonies. Members of the Jamat, including family members of other faiths, are encouraged to attend. H.H. The Aga Khan is expected to arrive in Ottawa, Canada early next week to attend at 10:30am on 16th May the opening of the new HQ of the Global Center of Pluralism at an event which will also be attended by the Trustees including The Governor General David Johnston, Former Governor General Adrienne Clarkson, Former UN Secretary General Kofi Annan and many other high profile guests. His Highness the Aga Khan, spiritual leader of Shia Ismaili Muslims around the world, and His Excellency the Right Honourable David Johnston, Governor General of Canada will welcome distinguished guests to the official opening of the Centre’s new permanent headquarters in Ottawa. In the beautifully restored heritage building at 330 Sussex Drive, formerly the Public Archives of Canada (1905-1967) and the Canadian War Museum (1967-2005), the Centre will continue to expand its work as a global platform for comparative analysis, learning and dialogue about the importance of valuing diversity both in Canada and around the world. The opening ceremony celebrates the long-standing public-private partnership between His Highness and Canada. Please note this event is by invitation only. We invite you to participate by watching the livestream coverage and following us on Twitter @GlobalPluralism for live-tweets from the event with the hashtag #330Sussex. OTTAWA—His Excellency the Right Honourable David Johnston, Governor General of Canada, will join His Highness the Aga Khan at the official opening of the new international headquarters of the Global Centre for Pluralism, in Ottawa, on Tuesday, May 16, 2017, at 10:30 a.m.
During this event, the Governor General will deliver an address on the importance of pluralism and the role the Centre and Canada can play as leaders in this globally significant issue. The event will be streamed live online at www.pluralism.ca. It’s been many years in the making, but the former Canadian War Museum (1967 – 2005) and before that the Public Archives of Canada (1905 – 1967), has been re-born. Now known as the Global Centre for Pluralism, the building at 330 Sussex Dr. is a study in the combination of heritage details and historical context, with contemporary functionality and an eye for timeless design. His Highness the Aga Khan, has invested $35 million in the restoration of this building, completed in 1905. A team of architects and designers has invested many years of thought, research, and planning into rejuvenating the building to 21st century standards, while at the same time advancing the idea that this Ottawa landmark might be a catalyst for improving its environs. This has included removing asbestos from the walls and then insulating them; replacing all heating, cooling and lighting systems to improve energy efficiency; and introducing contemporary design elements to the building. The place where Canadians once came to commemorate this country’s contributions to war has been boldly reimagined for the 21st century as a centre that fosters pluralism and celebrates diversity as a new international value. Built between 1904 and 1906, 330 Sussex Dr. was designed by David Ewart, the chief dominion architect. His other notable buildings include the Royal Canadian Mint and the Canadian Museum of Nature. It served as the dominion archives for 60 years before becoming the Canadian War Museum in 1967. The three-storey Tudor Gothic stone building has been vacant since 2005, when the war museum relocated to its new space on LeBreton Flats. Now, a decade after a $35-million restoration led by KPMB Architects — and paid for by the Aga Khan —began, the Global Centre for Pluralism’s international headquarters officially opens on Tuesday. When the Citizen was given a sneak peek inside late last week, workers were busy with the finishing touches. Ottawa, 15 May 2017 — Mawlana Hazar Imam arrived in Ottawa this afternoon, accompanied by Princess Zahra and Prince Aly Muhammad. 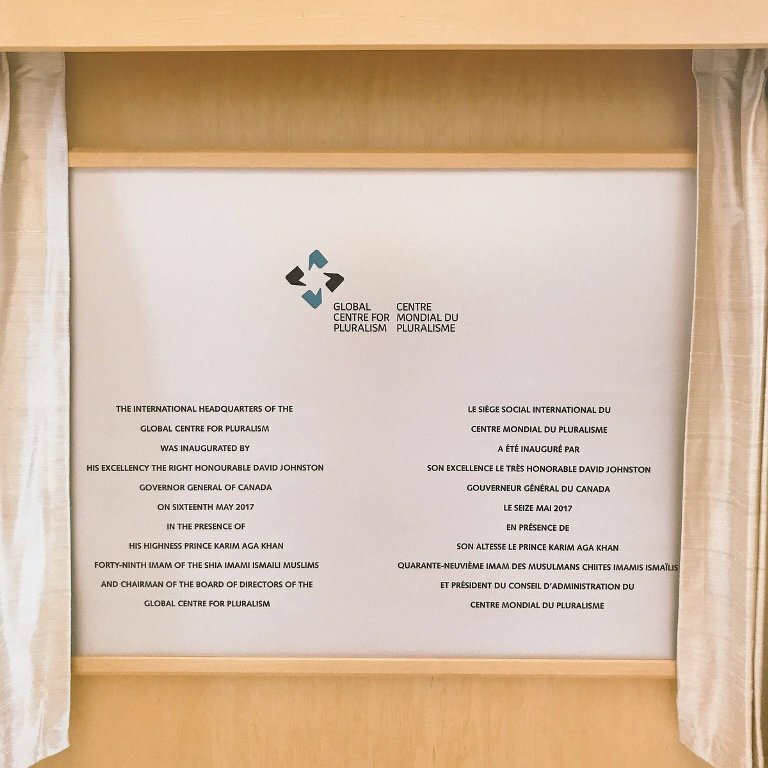 Tomorrow Hazar Imam will be joined by His Excellency the Right Honourable David Johnston, Governor General of Canada for the official opening of the international headquarters of the Global Centre for Pluralism. 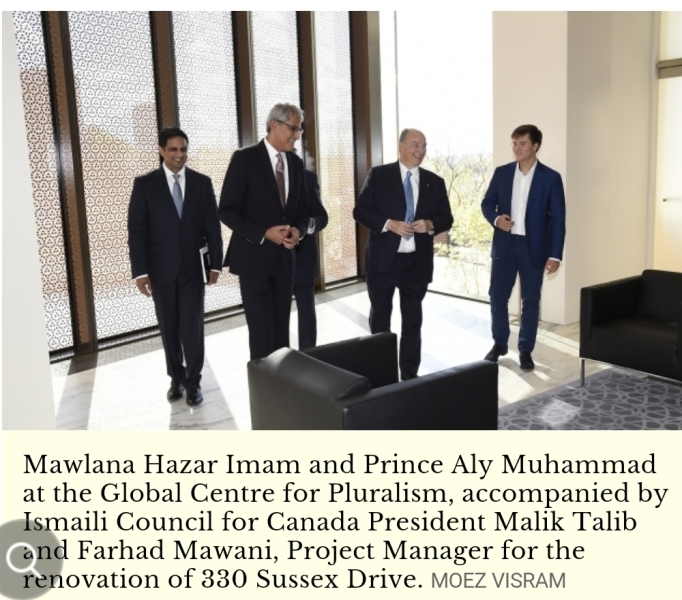 Soon after their arrival, Mawlana Hazar Imam, Princess Zahra and Prince Aly Muhammad visited the Global Centre for Pluralism, and were given a tour of the building by John McNee, Secretary General of the Centre. Situated at 330 Sussex Drive, the new permanent headquarters of the Global Centre for Pluralism is a heritage building that served as the Public Archives of Canada between 1905–67 and as the Canadian War Museum from 1967–2005. The facility underwent a significant transformation before reopening its doors in January of this year. The opening ceremony will be streamed live at the websites of the Global Centre for Pluralism, the Aga Khan Development Network and the Globe and Mail. The webcast is due to start at 10:30 AM EDT (Ottawa time). Project manager Farhad Mawani explained how Ewart wanted Ottawa to have buildings that befitted a capital city and, for their time, had modern touches, such as open concepts, plain white walls and exposed beams. Some of the materials used, then and now, include white oak and marble. Considered a Class A national historic building, the highest rating possible, the renovations to 330 Sussex — which sits between the National Gallery of Canada and the Mint on a perch overlooking the Ottawa River — had to be minimal and sensitive. “We didn’t just want to start ripping everything out,” Mawani said. Design work was completed in 2013, lead and asbestos were removed the next year, and construction began in earnest the year after that. The Centre’s 14 staff have been working out of it since January. An addition, built in the 1920s, will be occupied by the Mint. A third wing never materialized, so the building has retained its asymmetrical, L-shape. Two things now set the building apart from earlier versions of itself. A new courtyard off Sussex featuring benches and blooming flower beds is intended to draw people in and create a new public space. “Already, even though it’s been a bumpy start to spring, there are lots of people coming and sitting and chatting, and that’s the idea,” secretary general John McNee said in an interview. The forecourt, as he called it, is unquestionably lovely, but the building itself feels austere, colonial and stuffy. It doesn’t scream pluralism or diversity. But McNee said its august location on the ceremonial route between Rideau Hall and Parliament Hill sends a signal that these are important values in Canada. The idea for this centre dates back to the 1990s when the Aga Khan began asking Canadian leaders to explain the success of Canada’s approach to diversity. Plus, when the building was the war museum, a giant tank greeted visitors. “That’s not terribly welcoming,” McNee said. The other unique feature, on the building’s back side facing the river, is an angular window that juts out, bathing all three storeys in natural light. Viewed from inside, it acts as a magnet, pulling people to it, compelling them to stare out over the river below. It symbolizes opening a door to the river and simultaneously acts as a nod to the organization’s raison d’être to position Canada as a country that’s open to the world. KPMB took the trefoil design that’s repeated on the building’s parapet and reinterpreted it to create a pattern that is used as a screen on part of the window and also for acoustic panelling in one of the centre’s key spaces. Elsewhere, walls are adorned with Canadian art. The idea was to choose artists or pieces that tell a story of pluralism in Canada. Former Governor-General Adrienne Clarkson, who sits on the centre’s board, was on the committee that selected the art. The Global Centre for Pluralism is one of 150 buildings participating in this year’s instalment of Doors Open Ottawa. Curious members of the public can visit on June 3 between 10 a.m. and 4 p.m. The Global Centre for Pluralism is also part of the National Capital Commission’s Confederation Pavilions program. It will be open from June 7 until the end of October for self-guided tours on Wednesday evenings and Saturday afternoons. The international headquarters of the Global Centre for Pluralism (formerly the War Museum) at 330 Sussex Drive have undergone a major rehabilitation led by the award-winning architects KPMB and supported by a $35 million investment from the Aga Khan. 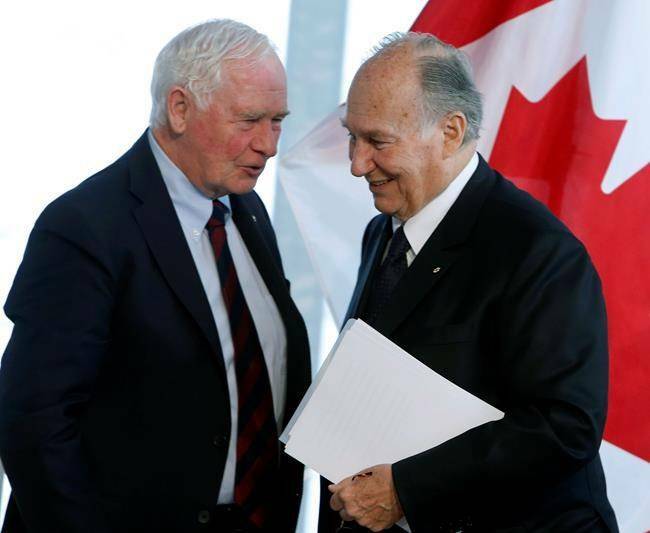 May 12,2017.
he Aga Khan was in Ottawa Tuesday for the grand opening of the Global Centre for Pluralism, a think tank founded by the billionaire Ismaili Muslim leader with $30-million in federal-government support. However, the Aga Khan’s long-time family friend, Justin Trudeau, was nowhere to be seen at the event. The Prime Minister’s absence comes amidst an investigation into his family’s vacation to the Aga Khan’s private island last Christmas. A source familiar with the matter said the Prime Minister was invited to the event. But according to a PMO spokesperson, Mr. Trudeau was attending a cabinet meeting on Parliament Hill at that time, about one kilometre from the centre. The Aga Khan was not available to answer reporters’ questions Tuesday, according to staff organizing the event. Asked why Mr. Trudeau was not in attendance, Heritage Minister Mélanie Joly, who represented the Liberal government at the centre’s opening, refused to directly answer reporters’ questions. Mr. Trudeau’s Open and Accountable Government rules prohibit ministers and parliamentary secretaries from accepting sponsored travel without approval of the ethics commissioner. He came under fire from both the Conservatives and NDP for the ethics controversy again in Question Period on Tuesday. In what was likely to be her last question in the House of Commons to the Prime Minister, outgoing interim Conservative Leader Rona Ambrose demanded Mr. Trudeau reveal whether he has met with the ethics commissioner to discuss the vacation. “This is likely my last question for the Prime Minister, so I am going to make him an offer. I will call off the attack dogs and nobody on this side will ask the question 18 more times. I think that sounds like a pretty fair deal. Let us end this with a real answer,” Ms. Ambrose said. Responding to question, Mr. Trudeau said Ethics Commissioner Mary Dawson has asked him not to discuss the process. Ms. Dawson, whose term ends on July 8, is currently investigating Mr. Trudeau for a possible breach of the Conflict of Interest Act for not seeking her approval before he took the Aga Khan’s private helicopter from Nassau to Bell Island. Mr. Trudeau has admitted he did not seek Ms. Dawson’s approval, saying that he does not believe he did anything unethical as the only way to get to the island was to use the Aga Khan’s personal helicopter. On Monday, Mr. Trudeau recused himself from making a decision on Ms. Dawson’s replacement, given the ongoing investigation into his family’s vacation. Government House Leader Bardish Chagger will be responsible for naming a replacement for Ms. Dawson. The centre is also distancing itself from Mr. Trudeau’s vacation controversy. “This is not a matter for the Global Centre for Pluralism,“ said John McNee, secretary-general of the Global Centre for Pluralism. Mr. McNee said the centre is thrilled to officially move into its new office at 330 Sussex Dr. The federal heritage building, located beside the Royal Canadian Mint, used to be home to the Dominion Archives of Canada and the Canadian War Museum. It recently underwent a massive $35-million restoration, and now houses the centre in one wing and some Mint offices in the other. The centre, which began operating in 2011, was housed at the Delegation of the Ismaili Imamat, another Aga Khan building on Sussex, until renovations were completed this year. Mr. McNee said the new building will allow the centre to establish itself in its own space. It will publish 25 analytical papers this year examining the state of pluralism around the world, including in Bolivia, Singapore and India. Mr. McNee said there will also be a $50,000 Global Pluralism Award for an international advocate or organization working to promote diverse, inclusive societies around the world. “His Highness and our board see the Global Centre as a permanent institution because it deals with problems of human society that are never fixed,” Mr. McNee said. Former UN secretary-general Kofi Annan, who sits on the centre’s board, emphasized the importance of the centre’s work amidst the rise of populism and anti-immigrant sentiments around the world, including in the United States. OTTAWA – The Aga Khan returned to Ottawa today to unveil the new headquarters of an international organization that is positioning itself as an antidote of sorts to the growing strains of populism and intolerance. But if you thought for one minute that the wealthy philanthropist, who is hereditary spiritual leader to the world’s 15 million Ismaili Muslims, would talk about that helicopter ride he gave to Justin Trudeau over the Christmas holidays, forget it. The 80-year-old Aga Khan kept the focus on the opening of the new home for the Global Centre for Pluralism – part think tank, part advocacy group – in a renovated piece of prime Ottawa real estate on Sussex Drive. John McNee, secretary general of the centre, is well aware of the controversy that has dominated Parliament Hill in recent months: the prime minister’s ride on the Aga Khan’s private helicopter ride to visit his private island in the Bahamas. “That’s not a matter for the Global Centre for Pluralism,” McNee said in an interview. The Conservatives have loudly condemned Trudeau for the trip, which they say violated the Conflict of Interest Act, and are demanding to know more about an ongoing probe of the voyage by the federal ethics commissioner. OTTAWA — The Aga Khan returned Tuesday to Ottawa to unveil the new headquarters of an international organization that is positioning itself as an antidote of sorts to growing strains of populism and intolerance around the world. Board members of the Global Centre for Pluralism, including former governor general Adrienne Clarkson, singled out the arrival of Donald Trump in the White House as something that makes the centre's work even more relevant. "We have to keep a very careful eye on not only the countries that have a history of turmoil but also on places like the United States, where the rule of law is being flouted by the president," said Clarkson. "It is terrifying to see that on a daily basis, and think, how is that going to work out in the end because it's such an important power — it's a great country." Board member Kofi Annan, the former UN secretary general, singled out Trump for blaming foreigners for taking American jobs "and other bad things," and for deceiving unemployed Americans in the rust belt that he can revive the coal industry to create jobs. "When you don't do that and you lie to them, I worry what happens (the) next time they realize they've been deceived," said Annan. Controversy hovered over the Ottawa appearance of the Aga Khan, a wealthy philanthropist and hereditary spiritual leader to the world's 15 million Ismaili Muslims. He gave Justin Trudeau a controversial helicopter ride to his private island in the Bahamas over the Christmas holidays, something the opposition continued to press the prime minister on during question period on Tuesday. The 80-year-old Aga Khan kept the focus on the opening of the new pluralism centre — part think tank, part advocacy group — on a renovated piece of prime Ottawa real estate on Sussex Drive. John McNee, secretary general of the centre, declined comment on the helicopter controversy, saying: "That's not a matter for the Global Centre for Pluralism." The Conservatives have loudly condemned Trudeau for the trip, which they say violated the Conflict of Interest Act. They are demanding to know more about an ongoing investigation by the federal ethics commissioner. A former aide to Stephen Harper says the Conservative ex-prime minister was hopeful none of that would overshadow the opening of the new pluralism centre headquarters, or its core mandate of promoting diversity in a troubled world. "He's hugely supportive of it," said Rachel Curran, who served as Harper's policy director. "He's always thought the Aga Khan was one of the leading voices in the world for the promotion of peace and pluralism." She said the helicopter controversy reflects more on Trudeau than the Aga Khan. "I don't think it will reflect on the work of the centre or the Aga Khan's work . . . It's a distraction for sure." Harper, who gave the Aga Khan honorary Canadian citizenship, visited his resplendent Ismaili Centre in Dubai in January and said in a tweet that it reminded him of "what a tremendous force for global peace and pluralism the Aga Khan is." Trudeau, meanwhile, has said the Aga Khan is a longtime family friend, dating back to the early 1970s when his father, then-prime minister Pierre Trudeau, gave sanctuary to Ismaili Muslims fleeing Ugandan despot Idi Amin. "Liberal and Conservative prime ministers have all readily responded to the Aga Khan's interest in promoting pluralism in the world, drawing on Canada's experience," said McNee. The centre is set up as a registered non-profit and had been operating since 2011 out of the Delegation of the Ismaili Imamat, the Aga Khan Foundation's building also on Sussex Drive. McNee said some of its previous activities have included keynote events featuring the chief justice of the Supreme Court of Canada and the architect of South Africa's post-apartheid constitution. That's just a taste of what's to come in the centre's new home, which used to house Canada's war museum, said McNee. There will be more speeches and public discussions, and research papers have been commissioned on the diversity challenges in places such as Bolivia, Singapore and India. There will also be a $50,000 Global Pluralism Award for an international advocate of human rights and "inclusion," said McNee. What a great day this is for all of us. And what a special ceremony, as we honour a beautiful symbol of Canada’s rich past, and rededicate it to the great cause of a pluralistic Global future. As you know, the War Museum Building was designed well over a century ago by the great Canadian Architect, David Ewart. For its first half century, it was the home of the Dominion Archives, and then, for another half century, we knew it as the War Museum. For over one hundred years, all told, it was a place where the record of Canada’s proud and confident past was preserved and honoured. I think you will agree with me that the past still speaks to us in this place. The architects, designers, engineers and so many others who have rehabilitated this wonderful Tudor Gothic building have taken enormous care to respect its distinctive historic character. We all join today in saluting the design and engineering team led by KPMB, the construction team, led by MP Lundy Construction, and so many other dedicated staff and volunteers who have contributed to this project. J'aimerais partager une autre pensée alors que nous tournons nos regards vers ce passé si digne de respect. Je trouve en effet très approprié que cette cérémonie ait lieu cette année, l'année du 150ème anniversaire de la Confédération canadienne. Je suis heureux de pouvoir me compter au nombre de ceux qui, cette année, évoquent avec une fierté particulière "notre" histoire canadienne. La raison en est bien sûr la générosité dont ce pays à fait preuve à mon égard, il y a plusieurs années, en m'octroyant le titre de citoyen honoraire du Canada. But even as we celebrate the past today, we are also looking ahead, with joy and confidence, to a particularly exciting future. That future has also been symbolized by those who have renewed this building, in two compelling ways. First, they created a new garden in the forecourt, a tranquil space for contemplating the past and thinking about the future. And then, secondly, they made a dramatic new gesture for the future by opening this building to the river. When I first visited this site, I went across the Ottawa River, to see things from the opposite side. From that perspective, I noticed that many buildings on the Ontario side had, over the years, turned their backs to the river. But as we began to plan, another possibility became evident. It seemed increasingly significant to open the site to the water. Water, after all, has been seen, down through the ages, as the great source of life. When scientists search the universe for signs of life, they begin by looking for water. Water restores and renews and refreshes. And opening ourselves and our lives to the water is to open ourselves and our lives to the future. In addition, the Ottawa River represents a powerful connection to other places, nearby and far away. It is not only a refreshing symbol, it is also a connecting symbol, connecting this site to the rest of Canada and the rest of the world. Throughout the history of Canada, the Ottawa River has been a meeting place for diverse peoples, originally the First Nations, and then the British and the French, and more recently Canadians from many different backgrounds. It symbolizes the spirit of connection. And the spirit of connection, of course, is at the very heart of the Global Centre for Pluralism. The new forecourt garden suggests that the Centre will be a place for contemplation and reflection. And the opening to the River suggests that it will also be a place for connection and engagement. What happens at 330 Sussex Drive in the years ahead will radiate out well beyond its walls, to the entire world. Let me emphasize a point about the concept of pluralism that is sometimes misunderstood. Connection does not necessarily mean agreement. It does not mean that we want to eliminate our differences or erase our distinctions. Far from it. What it does mean is that we connect with one another in order to learn from one another, and to build our future together. Pluralism does not mean the elimination of difference, but the embrace of difference. Genuine pluralism understands that diversity does not weaken a society, it strengthens it. In an ever-shrinking, ever more diverse world, a genuine sense of pluralism is the indispensable foundation for human peace and progress. From the start, this has been a vision that the Ismaili Imamat and the Government of Canada have deeply shared. My own close association with Canada began more than five decades ago, with the coming to Canada of many thousands of Asian Ismailis, essentially as the result of Idi Amin’s anti-Asian policies in Uganda. That relationship has been re-enforced through the years as we have shared with our Canadian friends in so many great adventures, here in Canada and in other lands, including the Global Centre for Pluralism. The Centre has been, from the start, a true partnership - a breakthrough partnership - a genuine public-private partnership. And one of my central messages today is how deeply grateful we are to all of those who have made this partnership so effective. It was with Prime Minister Jean Chretien, that we first discussed the idea of founding a new pluralism centre, and it was Prime Minister Paul Martin who helped develop the plan. Prime Minister Stephen Harper’s government sealed the partnership and Minister Bev Oda then signed with me the establishing Agreement. Minister Mélanie Joly has also given strong support to the GCP. And Prime Minister Trudeau has articulated, with conviction and with passion, the need for pluralism in our world. I think, too, today of so many other public servants who have helped guide this effort, including Universities Canada, the IDRC and other past and present members of the Corporation of the GCP. And I also thank the fine cooperation we have received from the Canadian Mint, who will share with us in occupying one wing of this building. As we celebrate the progress we have made today, we also recognize the growing challenges to our mission, as nativist and nationalist threats to pluralism rise up in so many corners of the world. In responding to these challenges, the Global Centre for Pluralism has planned a variety of new initiatives. Among them are the new Global Pluralism Awards which will recognise pluralism in action around the world, as well as a distinguished series of new publications. As we look today both to the past and to the future, we do so with gratitude to all those who have shared in this journey, and who now share in our pursuit of new dreams. Among them is someone whom we welcome today not only as a distinguished Statesman, but also as one whose personal support has inspired us all. It is a pleasure and an honour to present to you His Excellency the Right Honorable David Johnston, the Governor General of Canada. Hon. Mobina S. B. Jaffer: Honourable senators, earlier today, His Highness the Aga Khan, joined by the Right Honourable David Johnston, officially opened the new international headquarters of the Global Centre for Pluralism, located at 330 Sussex Drive in Ottawa, an event I had the honour to attend. For over four decades, the Aga Khan has invested in Canada's cultural and social fabric. The Aga Khan Museum in Toronto, the Aga Khan Garden in Edmonton, the Delegation of the Ismaili Imamat in Ottawa and the Ismaili Imamat Centres in Vancouver and Toronto have become iconic places for engagement and enlightenment. 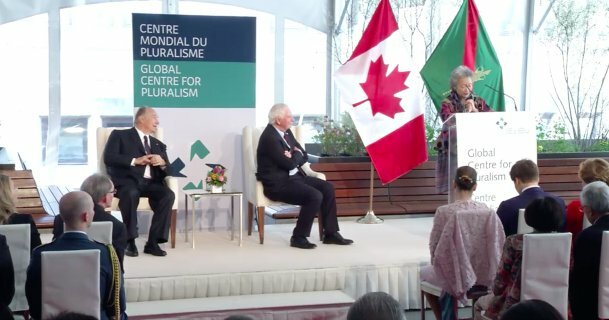 The Global Centre for Pluralism, which represents a unique partnership between the Ismaili Imamat and Canada, was inspired by a shared commitment with Canada's leadership to the profound importance that pluralism must play in an interconnected world. This commitment was shared by Prime Ministers Chrétien, Martin, Harper and Trudeau, all of whom contributed to the creation of this institution. Honourable senators, in a time where politics is becoming increasingly divisive, the Global Centre for Pluralism is a reminder that diversity is not a weakness but instead is a powerful force for good — that values of tolerance, justice, pluralism and mutual respect are very much a part of the Canadian identity.
. . . pluralism, in essence, is a deliberate set of choices that a society must make if it is to avoid costly conflict and harness the power of its diversity in solving human problems. Our hope and expectation is that the Global Centre for Pluralism will become a vital force in our world for research, learning and dialogue, engaging Canadians from all walks of life, and joining hands with a widening array of partners. Honourable senators, I encourage you not only to visit the Global Centre for Pluralism, which is a restoration masterpiece in its own right, but to understand how this institution can be a force in promoting global stability and harmony. Finally, I would like to congratulate His Highness the Aga Khan, chair of the centre's board of directors, for his significant investments in different regions in Canada and for the betterment of the world. Ottawa, 16 May 2017 — Mawlana Hazar Imam and His Excellency the Right Honourable David Johnston, Governor General of Canada officially opened the new international headquarters of the Global Centre for Pluralism today. The heritage building at 330 Sussex Drive that now houses the Centre was built over a century ago. It once held the archives of the Dominion of Canada, and later served as the Canadian War Museum. The building has been beautifully restored to its new purpose as the home of the Global Centre for Pluralism. In the 150th anniversary year of Canadian confederation, “the past still speaks to us in this place,” noted Mawlana Hazar Imam. The renewed building, he said, connects “a new garden in the forecourt — a tranquil space for contemplating the past and thinking about the future” — with the magnificent and symbolic Ottawa River visible on the other side. 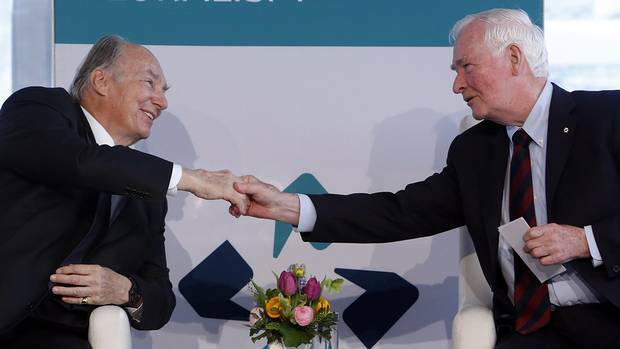 The Governor General of Canada underscored the urgency of pluralism, saying that it is “critical for the long term peace and prosperity of societies worldwide.” Its success, he said, depends on developing a compelling narrative about the value of diversity. Princess Zahra and Prince Aly Muhammad attended the event, along with a distinguished audience of more than 200. The gathering took place under a marquee erected in the gardens in front of the building. The Government of Canada was represented by the Honourable Mélanie Joly, Minister of Canadian Heritage. John McNee, Secretary General of the Global Centre for Pluralism and its Board of Directors were also present. Mawlana Hazar Imam and the Governor General unveiled a plaque commemorating the occasion. Earlier in the day, the two had toured the building and had an opportunity to meet privately. 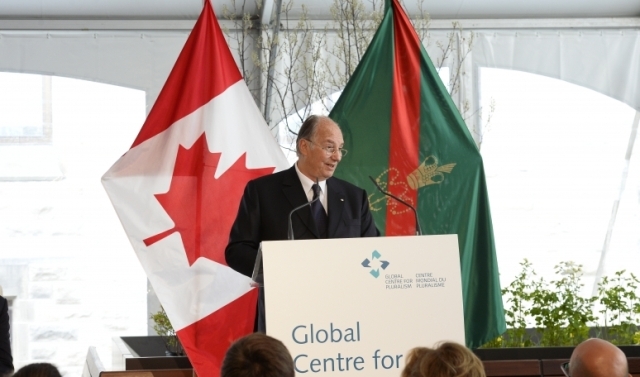 The Global Centre for Pluralism is a public-private partnership between the Ismaili Imamat and the Government of Canada. The Centre’s work includes conducting research into how countries have changed their approaches to diversity, hosting seminars with global communities of experts and practitioners to deepen understanding of pluralism and its applications, and creating educational tools to help teach the values underpinning pluralism. The Centre’s Annual Pluralism Lecture, now in its sixth year, features international leaders who have dedicated their lives to advancing respect for diversity, and a newly established, bi-annual Global Pluralism Award celebrates extraordinary examples of pluralism in action.